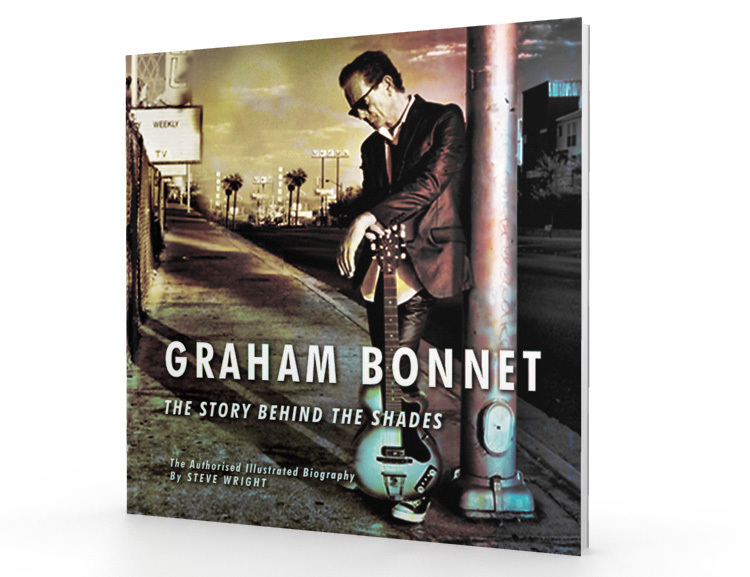 Graham Bonnet – The Story Behind The Shades. The Authorised Illustrated Biography. By Steve Wright. The above email button will allow you to join a special mailing list and keep you updated on the book’s progress, and any pre-publication offers or special editions. You can unjoin any time you want. So runs Graham Bonnet’s wikipedia entry. Of The Skyliners, The Peter Tomlinson Band, The Jimmy Aldred Band, The Jan Ramsden Band, The Missing Links, The Blueset, The Bluesect and The Graham Bonnet Set not a word. This new biography of the much travelled rock singer more than fills the missing gaps. Author Steve Wright was the ideal person to put this exhaustive book together, running the singer’s fanzine for many years, and with unique access to Bonnet’s own archive as well as friends and family. The result is an honest and detailed read which will fascinate anyone interested in Bonnet’s career, as well as wanting to know more about the development of pop and rock in the UK during the immediate post-war years. And what a career it has been. From Skegness to Australia, early success with The Marbles, then returning with a well-regarded solo album in 1977 which saw him high in the Australian charts. This was the spring-board for his rock career, with both The Sweet and Ritchie Blackmore’s Rainbow keen to secure his services. Blackmore’s offer was the more tempting, though following singer Ronnie James Dio in 1979 was a far from easy ride. ‘Mistreated’ was my audition song, because I didn’t know any Rainbow songs!” Rainbow suddenly found themselves with well-crafted AOR hits in the shape of “Since You Been Gone” and “All Night Long”. Bonnet’s most consistent rock project came in 1983 when he decided to put his own rock band together, and Alcatrazz became a huge draw on the rock circuit for the next four years, particularly in Japan. Now based in LA, the ever adaptable Bonnet continues to record and tour on a regular basis, with European shows during 2014. As for the biography, Bonnet has been sanguine about some of the wilder moments of his rock career. Taking the attitude that there is no point in airbrushing out events, he preferred them to remain within the context of a long and interesting career. Steve Wright’s detailed research brings to print much even hardened fans will not have read about Bonnet’s career, with plenty of rare photographs and memorabilia spread throughout the book. As well as the standard edition, plans are in place for a limited edition signed by Graham Bonnet himself, with a CD of rare material and a unique cover design. More details , along with page visuals, on the publisher’s website.